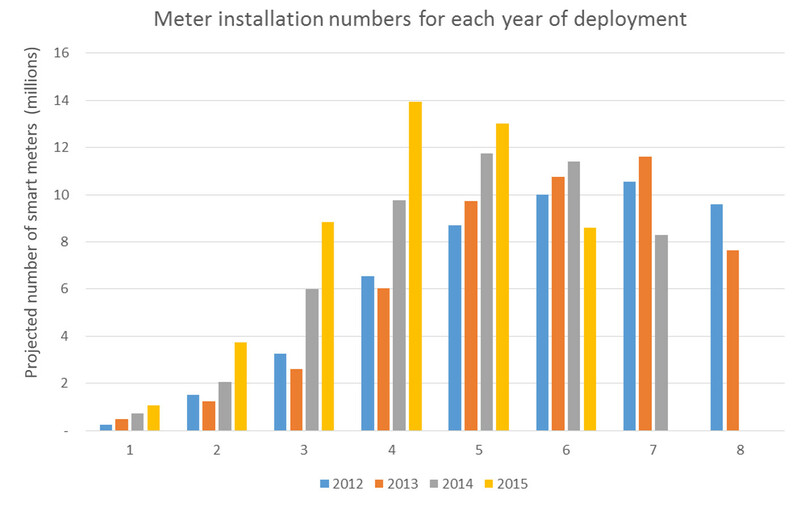 As expected, everything’s slipped, but this time, for the first time, we get an example of how DECC fudges the benefits figures they claim justify the smart metering programme. I sometimes wonder whether I’m the only person who reads these reports beyond the rose-tinted executive summary, as if you dig beneath the spin, they tell a clear and repeated story of a project that is going badly wrong. So for anyone who didn’t make it past page 6, here’s the truth about what’s happening with the GB smart metering deployment. Let’s start with looking at how DECC fudge the numbers. In my review of last year’s report I highlighted how DECC has refused to divulge how they calculated the consumer benefits of smart metering, spending large chunks of taxpayers’ money on expensive lawyers to argue against Freedom of Information requests. If everything had gone to plan, we’d have around eleven and a half million meters installed by now, instead of which we’ve barely a tenth of that. But even with around a million meters out there, you would have expected that there would be a fair amount of evidence about how much they affect customer behaviour and how much customers have saved. After all, those saving are the bedrock of DECC’s financial justification of the whole program. 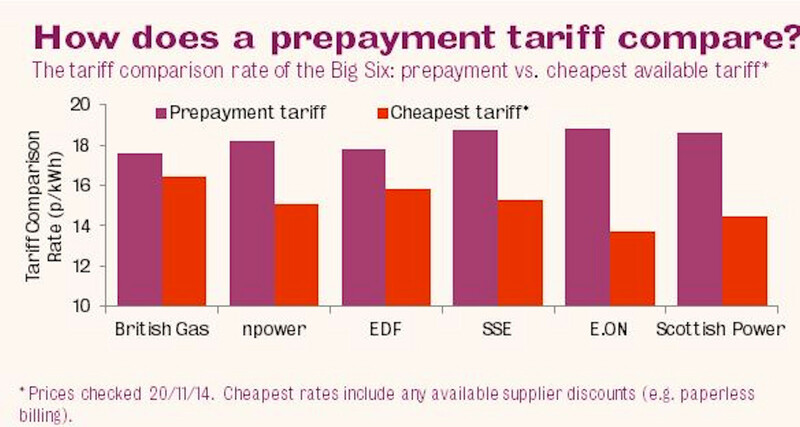 In DECC’s case study, the prepay customers with new smart prepay meters were given the opportunity to move from the punitive E.On prepay rate they had been on to any of E.On’s cheaper rate. If they did, then E.On estimated that they could save up to £104 a year. They would achieve this saving only because E.ON had previously been overcharging them by up to 37% for being energy poor – effectively treating them as second class citizens. This has nothing whatsoever to do with the smart meter. The users could have made exactly the same savings if E.On had let them choose a cheaper tariff with their existing dumb meters. Yet this is the only example of consumer savings DECC could find to include in its smart metering report, presenting it as if the smart meters were responsible for the saving, and as if it were real, rather than estimated. It does make you wonder how they calculated their original figures justifying smart metering, but as they’re still blocking Freedom of Information requests we can only guess. I’m guessing it’s the same sort of fudge we see here. On the subject of consumer behaviour change, DECC does reference some initial feedback from an Early Learning Project, which predominantly looks at user reactions to In Home Devices (IHDs). It emphasises “the importance of real-time traffic light feedback”: red, green and amber lights on the IHDs which indicate how much power is being used, pointing out this is the “most used” aspect of the display. Guess what DECC refused to include in their IHD specifications? Traffic light indicators. It’s nice to see the right hand still doesn’t know the left hand exists. 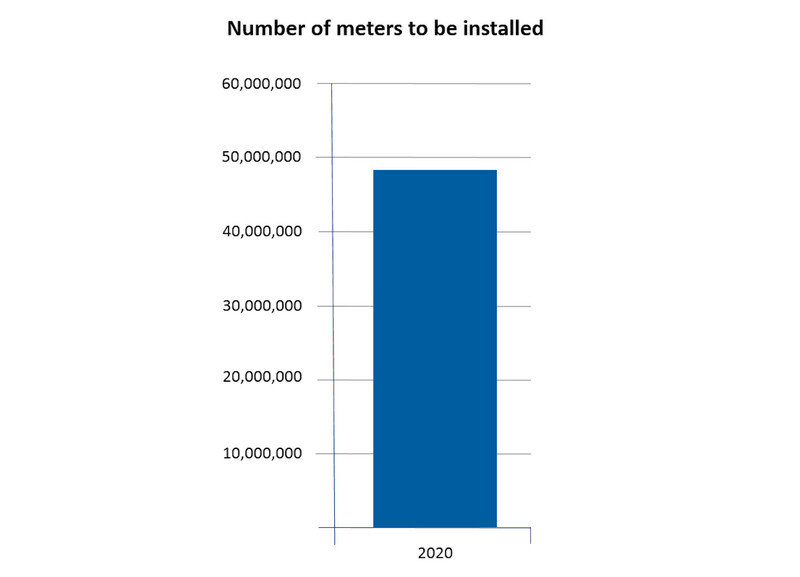 In the first report in December 2012, the assumption was that all of the meters would be installed by the start of 2020. In the following year, that slipped to the end of 2020. It’s not unusual for projections like these to slip – it’s a standard trick for analysts to move the baseline by 12 months when they do their annual update and realise nothing has happened. The problem here is that the end date of December 2020 is immovable, as the total number of meters which need to be installed. The Utilities don’t want them. When the UK programme started they were seen as a way of introducing complex tariffs and acquiring customers through switching. OFGEM has ruled against those tariffs and utilities are moving away from promoting switching. Most the current UK switching is driven by utility paybacks to switching companies, making it an expensive form of customer acquisition. That leaves smart meters as a very over-priced way of automating billing. Silicon Companies don’t want them. They initially pushed the ZigBee standard, hoping that smart metering would result in it taking off. It didn’t, and companies involved in supplying the chips have moved to a new mesh standard called Thread. It’s a lot better than ZigBee, but it’s not compatible. That means that the cost of ZigBee chips is likely to rise and in the future there will be little expertise to support them. A week after DECC released this report, Silicon Labs – a US chip manufacturer, acquired Telegesis – the last remaining mainstream UK company that makes ZigBee modules. Their engineers look likely to move to working on Thread. In other words, SMETS2 meters are based on an obsolete technology which will have minimal ongoing support. Network Operators don’t want them. The current deployment uses GPRS supplied by Telefonica / O2 for two of the three areas. GPRS uses the original 2G mobile technology, which every other operator is desperate to shut down, so that they can reuse the spectrum for 4G. The reason for that is that the same amount of spectrum used for 4G supports around forty times as many users as it does for 2G. Now that O2 is being acquired by Three, their accountants are probably desperate to find a way of getting out of this contract. Regardless of whether they do or not, when the contract comes to an end, the communications hub on every smart meter will need to be replaced with a new, more expensive one that supports 4G, or a new M2M wide area standard. Replacing these comms hubs prior to the 2G network being turned off at the end of the contract would wipe out most of Telefonica’s profits from the CSP contract, but it will be necessary. Otherwise the smart meters will stop working. That’s another little detail that DECC forgot in their costings. As a special buy one, get one free offer, if you do cancel the program all you need to do is change the heading to “Number of meters to be cancelled” and then get one of your friends in DECC to change the 2020 to whichever year you make your decision. 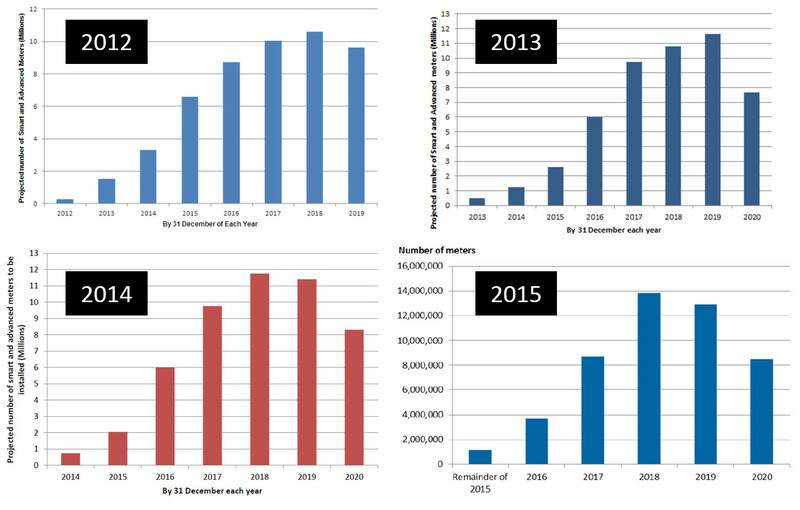 They may be challenged on energy policy, but changing dates on graphs is one of the things they’re really good at.